What Should You Include in Your Golf Bag? Is There a Complete Hybrid Golf Club Set? We’ve mentioned quite a lot that hybrid golf clubs make a wonderful addition to your golf bag. And don’t worry we’re probably going to mention it again. However, there may be some of you who are wondering whether it’s possible to make a full set of clubs using only hybrid golf clubs sets. Actually yes it is possible, and there are several companies who offer hybrid golf club sets, with the full selection of lofts you would expect from a traditional set of irons. Instead of using a range of irons to compliment your three wood and driver, all you’d need would be a couple of traditional woods and hybrids to take care of the rest of your shots. Some might consider this approach a little unique but there are benefits to be gained. What are the benefits of using a hybrid golf clubs set? It’s not considered to be the standard approach but take a look at the benefits and might become one of the converted. You will easily achieve consistency throughout your set by using a hybrid golf clubs set. Using the same type of club for all your shots means you don’t have to worry about changing your swing. There’s a lot to be said for consistency in the game, so you should do everything you can to achieve it. Another advantage of using an all hybrid golf set is you can deal with any lie you encounter. Hitting a bad-lie in the rough with a long or mid-iron is going to be difficult even for a seasoned pro. However, using a hybrid means you stand a much better chance of success. You’ll easily be able to conquer some of the most difficult shots if you incorporate hybrids into your set of clubs. Rather than laying up instead of aiming for the green is now going to be something that you’re not afraid of. For players with a low swing speed, a much higher ball flight can be achieved if you choose to use a hybrid. If your swing speed is below average you’re going to struggle to get sufficient loft on your iron shots, leading to difficulty in getting your ball to stop on the green. When conditions are dry and firm it can feel like an impossibility. With an all hybrid golf set you should be able to add some height to the flight of the ball, as well getting the ball to stop much faster once it lands. With such a difference you stand a much better chance of making pars and birdies, and getting your ball in the hole. If you’re not ready for such an innovative idea, what clubs should you carry in your golf bag? How many clubs should you carry? If you’re a novice to the game of golf you probably wondering what the optimum combination of golf clubs you should carry is. You’re probably not going to need the full set of 14 clubs, and can pare it down to nine or ten. Let’s look quickly at what shots each of the clubs are good for. There’s no point in including an iron numbered lower than 5 in your beginners set. In fact nowadays even professional golfers prefer to use hybrid iron sets rather than relying solely on the traditional irons. A 5-iron is a good one to start with because it’s fairly easy to get airborne off the fairway. It will also come in handy for par-three holes when you’re placing the ball on a tee. A 7-iron and a 9-iron are the next clubs to have, missing out the 6- and 8-irons. A pitching wedge will be good for chipping around the green and short shorts. This type of wedge is usually marked P or PW. 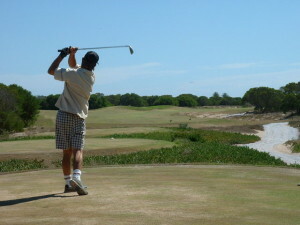 An option is to add a sand wedge as your technique may not be honed enough to take advantage of your club’s benefits. 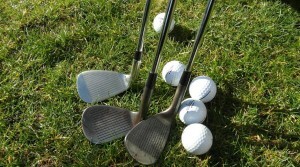 Two hybrid clubs should be more than sufficient for any beginner. The first hybrid iron set you buy should include a club with a loft between 18 and 21 degrees. They may be marked 2- or 3-hybrid. Your second hybrid should have a loft between 22 and 25 degrees, and will be marked 3- or 4- hybrid. Every standard golf bag should include a #1 wood or driver. It’s be useful for teeing off on most par 4 and par 5 holes, and maybe even some par 3’s as well. As a beginner you’re better off using a driver with plenty of loft. It will help lift the ball higher in the air. A loft between 10.5° and 13°would be best, unless you’ve got an uncommon novice clubhead speed. You will also need a fairway wood. A higher lofted club will be the best option to start with, such as a 5- or 7-wood, before eventually owning a 3-wood. A 5- and a 7-wood are ideal for long fairway shots as well as hitting off the tee. No golf bag would be complete without a putter. There are hundreds of different styles and variations, which makes it vital that you buy one you’re comfortable with. Things to consider are the length, weight and the feel when striking the ball. Make sure you try out lots of different ones before picking one that suits you best. So that’s what should make up your starter kit if you’re thinking of trying your hand at golf. There are also a few other items that will be good to include in your golf bag, along with your hybrid irons set. A marker pen – Use it to mark your golf balls and make them easier to identify. A clean towel – Wet on one end to keep your clubs and balls clean. A small brush might also come in handy. A ball-marker – Rather than using a tee to mark the position of your ball, a coin is a simple thing that can be used. A divot tool – All the following players will appreciate your efforts to repair the green. GPS device or rangefinder – You’ll be able to get a better idea of how far you are from the hole. A snack and some water – Food will keep up your energy levels and the water will keep you hydrated. Now you’re all set for your first game of golf. Enjoy!